KitMonsters – Tech 21 SansAmp Classic. The music makers’ guide to making music. The Tech 21 SansAmp Classic is a compact unit with a wide range of amp sounds you can achieve without an amp. It is made almost entirely by hand, and the main module contains a bank of eight Character switches, which adjust tonality, harmonics and dynamics. A three-position Input switch gives you a choice of pre-amp styles: Lead (Marshall®-style), Normal (Mesa Boogie®-style), and Bass (Fender®-style) and it is designed for rhythm as well as bass guitar. 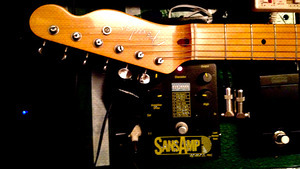 The controls shape pre-amp contours, power amp contours, volume and final tone. 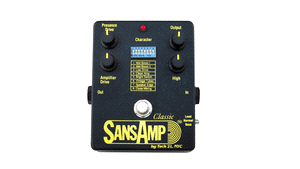 The SansAmp Classic is engineered with a flat output to provide maximum flexibility and control with external EQ. Celebrating musicians and the kit they use to get their sound. Interviews, gear, music tech, tips, reviews, music industry news, kit-pedia. All text & images © copyright KitMonsters Ltd 2012-2019 unless otherwise stated. All rights reserved.